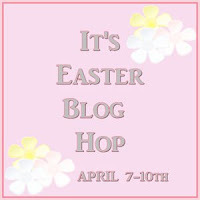 WELCOME TO DAY #2 of the IT'S EASTER Blog Hop, where a group of talented crafters will give you terrific ideas on how to celebrate Easter. Each of these very talented blog hoppers has put a lot of time into their projects for you. Please do visit each stop along the way and share love. If you've reached me, you've likely come here via Tristan's fun blog. And you're heading over to see Monica's gorgeous flowers and other crafts at Scraps2Treasure. If you're joining us mid-hop, please do start at the very beginning -- Shawnee will be delighted to welcome you at Blessed on the Bright Side. Since this blog hop runs through the weekend (April 7-10), you have plenty of time to visit each stop and comment on each, please. is now 4 mos old! 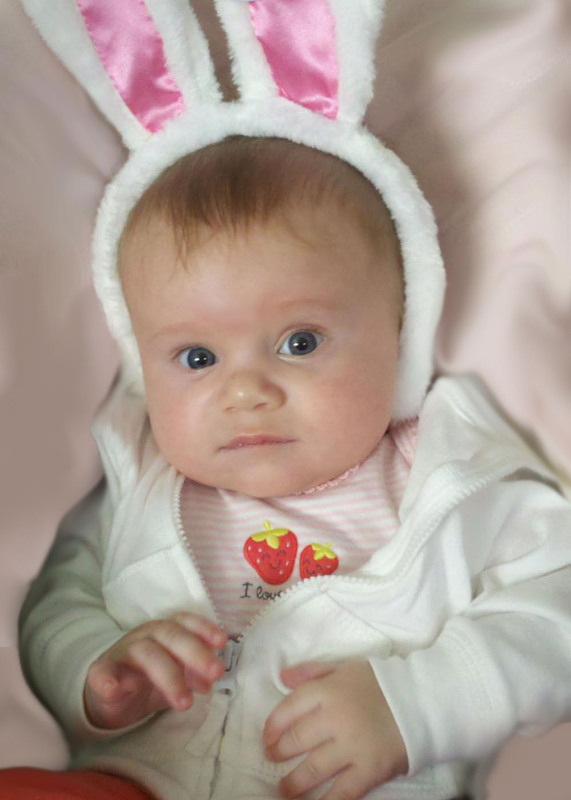 Each post will contain a different gift item you can put in a loved one's Easter basket. Not all of our friends/family can have candy, and some simply can't get enough. Some are traditionalists and want Easter eggs, and others don't care what is in the basket, as long as the Easter Bunny visits. Here's my project for DAY #2 - This is a simple pillow box cut using the image on Cricut's Easter 2010 cartridge. Yes, the bunny is already on it, and I just ♥ it! To make this box, I cut the Cricut image from lavendar paper. Before sealing the one side with sturdy Sookwang double-stick tape, I covered the opening for the bunny, from the inside, with a small piece of transparent acetate, so the candies won't fall out. The top and bottom fold in. I secured the bottom fold with double-stick Sookwang. I cut the grass, also from the Cricut Easter 2010 cartridge, and decorated the pillow box with ribbon and Jolee seasonal stickers. BLOG CANDY: One lucky follower will win the brand-new Paper Crimping Tool I mentioned in yesterday's post. You can use a crimper to seal edges (like with the "sour cream container" shown yesterday) or to create textured interest. I picked this tool out specially for this hop, since it's not a tool that everybody has in their arsenal! 1. Be or become a follower of this blog. This is mandatory, and I do check! 2. Post a comment here, and please include a way for me to contact you when you win! You can post one comment per day. 3. For one extra chance to win, post a comment on each of the 15 blog stops linked below once during the hop, and tell me you did or will, in your comment here. Great candy holder! I am a teacher and those would make a great gift for my TAs! :) Thank you for sharing your ideas! 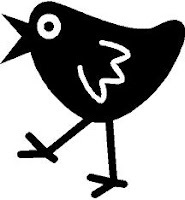 And I am posting my way through everyday on everybody, GREAT hop! Ellen, I love your creative ideas and how you always create the best projects. Thank you for joining me as part of this hop. I love the bunny cut out on the box! You are indeed creative Ellen! Great job on your project. I love that the Bunny is already on it. Soo cute. TFS. Glad I could be on this hop with you. I am posting on all stops in the hop! You ladies are amazing! These is just as cute as yesterdays. I have Easter 2010, and I really like it, too. That cut is just awesome, and I love the grass and eggs you added at the bottom. Love your pillow box and the cut bunny is adorable! Great pillow box for candy. The bunny cutout is perfect! TFS! Ellen you are so sweet to create items we can use for our childres,s (for me Grand children's) Easter baskets. You have a Great Easter and thanks for sharing. I am following! Now this I did a few weeks ago. Were you peeking? LOL........beautiful job! Love these candy holders! BEAUTIFUL! Cute project. My email is marg0006@verizon.net and my blog is loving scrapper 101. 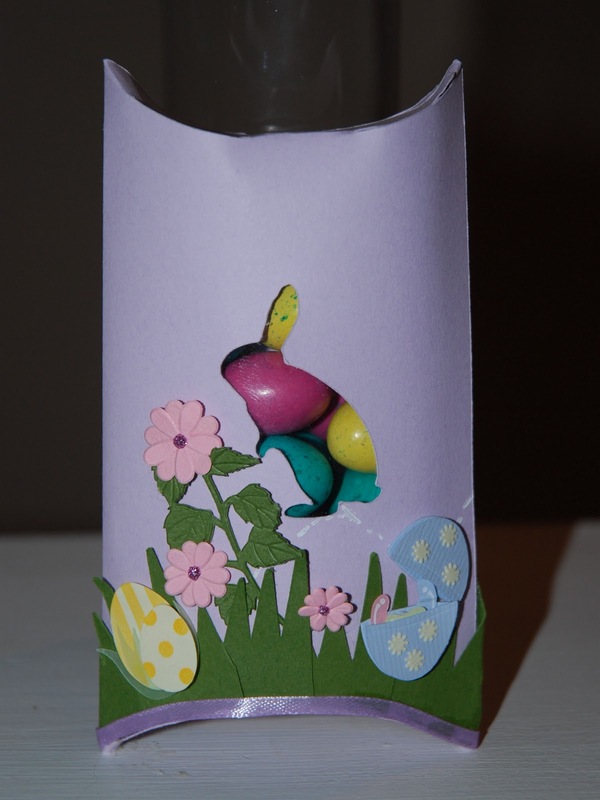 What a cute little container, great to hand out a little Easter sweetness! !